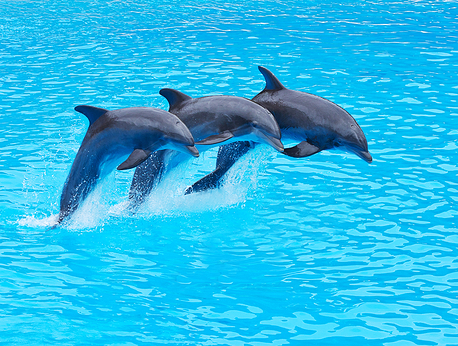 You cannot miss the Wild Dolphin Encounter and Snorkel Tour while visiting Key West and south Florida. Small and large groups are welcome. Enjoy cool refreshments, muse in the sight of wild dolphins interacting in the ocean then embark on your own personal snorkeling adventure in the nearby coral reefs. What better way to enjoy the company of friends and family than to spend time out in the ocean off the coast of Florida experiencing amazing dolphins interact amongst each other in their natural environment. The Wild Dolphin Encounter and Snorkel Tour allow you to do just that. The tour can accommodate six people, and is intended to be a very intimate experience with the magnificent creatures that are dolphins. On this tour, you will enjoy a comfortable boat ride out to the areas that are highly populated by dolphins to ensure a fantastic experience. These happy creatures each have their own fascinating personalities, and this tour allows you to observe each one of them while they interact in these exquisite waters. This three hour tour incorporates the opportunity to experience the underwater wonders of the sea. You will have designated time to snorkel in a nearby coral reef that provides a plethora of brilliant photo-taking opportunities. You may see various breathtaking exotic fish species, numerous colorful coral and possibly sea turtles or stingray. For your convenience, snorkeling gear is provided for you and your guests. Since staying hydrated is essential while under the sun, the tour includes refreshments that you and your guests can enjoy before and after your excursion. This is a wonderful opportunity to spend time basking in the sun while watching wild dolphins interact in their natural habitat. You will also get the opportunity to see the coral reef while snorkeling in shallow waters nearby. But the fun doesn’t stop there, experience the beautiful ocean waters that Key West has to offer while relaxing on the comfortable boat ride. You and your guests will have various opportunities to capture incredible photographs throughout the tour whether it is before the tour while mingling and enjoying refreshments, during the snorkeling expedition or while witnessing the dolphins play in the ocean.